Songs For A Widow — the fifth full-length Unto Ashes album — is an intense and magnificent album of apocalyptic folk, medieval doom, forest metal, heavenly voices, experimental gloomscapes, military funeral choirs, and synthetic darkwave. This New York-based trio is absolutely alone in what they do. Who else besides Unto Ashes could (or would) transform Covenant’s synth-pop anthem “One World One Sky” into a mournful funeral dirge? Who else would take the same song, rebuild it, and (on the same album) re-invent it once again as a colossal medieval dance, dripping with sweat and illuminated by fire? In fact, the album presents many subtle “echoes” throughout; thus the listener is harkened back to another place which may have occurred only moments — or ages — before. Songs For A Widow is crafted with a diamond-cutter’s precision, revealing a delicate balance between sublime harmony and harrowing disharmony, authentic medieval instruments and modern technology. As the album unfolds, the listener experiences one wildly divergent song after another, astonishing juxtapositions blending effortlessly — impossibly — from beginning to end. Unto Ashes’ fixation with formal compositional structures, meticulous vocal harmonies, and their infamous obsession to sonic detail are combined to create a sense of cohesion. Indeed, Songs For A Widow is unmistakably Unto Ashes at their finest. Witness songs of gemlike quality such as “Occupying Force,” an exquisite piece of music which transcends time and place and is itself worthy of Rivendell, or the album’s namesake “Song For A Widow,” haunted and murky as the tombs of Mordor. Though saturated with gloom, the album achieves high contrast within itself. Progressing from the Gregorian to the Dionysian through wild mood swings, dirges are transformed into dances, chants into hypnotic drumbeats. Lyrics are taken from many sources both inside and outside the band: here a canzone of Dante, there an original poem in German or neo-Latin. 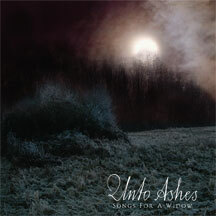 Always tinged with angst, Unto Ashes is yet unpredictable and wide-ranging in their choice of inspirations. On the eve of the Apocalypse, as darkness descends upon us all, Unto Ashes painfully wrings beauty from despair. Positioned at the vanguard of the darkwave scene, Unto Ashes will be opening for QNTAL on a 17-date European tour in October. The release of Songs for a Widow heralds a brilliant new development in the darkwave genre.